Day 1: We travelled by car to the port of Kiel, Germany, where we boarded the ferry that would take us to Gothenborg, Sweden. We enjoyed the sunshine and harbor scenery in Kiel while we waited to get onto the ferry. The ferry from Kiel to Gothenborg. Clouds gather above Kiel as we await departure. The ferry trip was rather uneventful. The sea was calm, and the ferry was so large besides that we'd hardly have felt any waves. The most exciting thing that happened was a beautiful sunset. July 4, 2004. 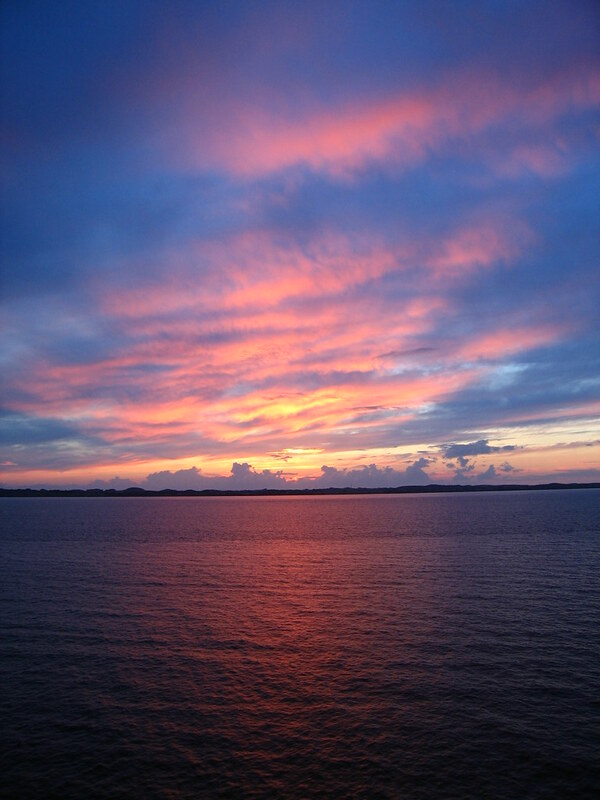 Sunset across Denmark's Great Belt (Storebælt) as seen from the ferry from Kiel, Germany to Gothenburg, Sweden. Silhouetted along the horizon is the island of Langeland. Day 2: we arrived in Gothenborg on schedule and continued by car towards Norway. The Uddevalla Bridge across the Sunninge Sound on the E6 motorway. The Vikingskipet (Viking Ship) skating rink in Hamar, Norway. Originally built for the 1994 Winter Olympics, today it still houses ice skating competitions. Our first stop in Norway was in a two-floor appartment in the town of Nordsæter, just northeast of the city of Lillehammer. Cows in the meadow behind our apartment in Nordsæter. View from the Nordsæter apartment. Panoramic view from the Nordsæter apartment. Day 3: Lillehammer is home to the Maihaugen Musuem, which consists of a collection of Norwegian houses and community buildings from throughout the centuries. Wood is the primary construction material in Norway, and has been for centuries. In the old days, sod roofs were a common way to provide insulation against the cold. The sods are placed on a layer of birch bark to make the roof waterproof. Me posing in front of an old train at Maihaugen Musuem. Wild strawberries at Maihaugen Musuem. Day 4: desolate Norwegian landscape. Cattle sometimes roam freely along and on the back roads. Snow-capped mountains in the distance. Helvete (Hell): a formation of sharp rocks and deep gorges created by millennia of erosion by water. Helvete: this half-submerged "bridge" allowed us to go deeper into the gorge, which of course we did. July 8, 2004. 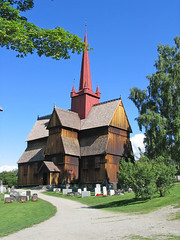 The Ringebu Stave Church (Ringebu Stavkyrkje) in Oppland, Norway dates back to the 13th century, though most of the current building stems from circa 1630. Stave churches were a common type of church in medieval Scandinavia. Today, only about thirty stave churches still survive in Norway. The walk through the Fokstumyra marshlands ran partly across these elevated paths, partly across dry terrain, and partly across rather wet ground. Unfortunately, none of our shoes were very waterproof. The Slettafossen waterfall was one of many waterfalls we saw. A random mountain range, with the sun and clouds adding a nice effect to the photo. Our next stop was a characteristic Norwegian wooden hut near the town of Gjerdset. The view from our hut featured other huts, a lake, forest, and mountains. Panoramic view from the deck of the Gjerdset hut. Day 7: sometimes one can use a bridge or a tunnel to cross a fjord, but ferries are also often used. When no bridge, tunnel or ferry is present, one has no choice but to drive all the way around the fjord. This can easily be a trip of several tens of kilometers just to cross a fjord of no more than a few kilometers wide. This mountain ridge lies close to the Atlantic shore and clouds were pushed up and over it from the west, depositing a blanket of clouds across the mountainscape. Day 8: the Mardalsfossen waterfall has the largest free fall of Northern Europe. Day 9: a road sign warning against trolls along the Trollstigvei (Troll's Road), a very spectacular mountain road. The Trollstigvei (Troll's Road) is Norway's most spectacular mountain road and a popular attraction for tourists. This picture of the Geiranger Fjord shows what a typical fjord looks like: an enlongated body of water with steep mountains rising up on either side. The fjords are in direct contact with the ocean. We came across more snow and ice as we drove higher up into the mountains, even though the temperature never dropped below zero ºC. Rough and desolate mountain terrain. Our third stop was a rather dark hut near the town of Kaupanger. Nearby was the Sogne Fjord, Norway's longest. A closer look at the Nigarsdbreen glacier. Note the size of the glacier compared to the people walking across it near the centre of the photo. We did a 1-hour walk across the glacier, tied together like this in case someone would slip or fall. The more compact the ice, the less air it contains, and the more colourful it gets. A close-up of the glacier's beautiful blue ice. The writing's on the ice wall. This water reservoir (used to create electric power) is fed by glaciers. Day 12: sheep roaming the barren terrain of the Hardangervidda mountain plateau. Our car doing duty as a scratch post. The Flåmsbana (Flåm Line) is another major tourist attraction in Norway. Construction on this railway started in the 1924 and was finished in 1940. The Flåmsbana is over 20 km long and ascends 863 meters from beginning to end. The steepest gradient is 5.5% (1:18), which is a world record for a regular traction railway. Only two of the twenty tunnels (totalling 6 km in length) were excavated using machines; the rest was done by hand. Nowadays, the railway is used almost exclusively for tourists. The Rjoandefossen waterfall as seen from the Flåmsbana. View from the Flåmsbana. On the left you can see part of the railway (the near-horizontal dark structure two-thirds of the way up the montain). The zig-zag road on the right was used during the construction of the Oslo-Bergen railway, which is just visible as a horizontal white structure left of the top of the waterfall. The Flåmsbana took us past the powerful Kjosfossen waterfall. Our fourth stop was an apartment near the city of Bergen. These stores are part of Bergen's Bryggen neighborhood. Some of the buildings in Bergen's Bryggen neighborhood date back almost 900 years. View from Bryggen across Bergen's harbor. Another look at the enormous Queen Mary 2. Day 15: The Fantoft stave church near Bergen. A rose in the Arboretet (Arboretum) a few kilometers south of Bergen. Flowering trees in the Arboretet. A view of Bergen from a mountain at the edge of the city, looking roughly to the south. Looking southwest from the same point. Looking west from the same point. A sailboat in Bergen's harbor. Day 16: the Låtefossen twin waterfalls. Our fifth stop was another wooden home, this one near the town of Hovden. Day 18: a not very steep and therefore very climbable waterfall. We started down at the road and climbed up here without getting wet. View of the Otra River near the town of Bykle. View from the top of the Vatndalsvatnet (Vatndal Dam). The water reservoir behind the Vatndalsvatnet. Day 19: the Heddal stave church is the largest stave church still in existence. A fountain in the Vigeland Park in Oslo, the capital of Norway. A monolith of human bodies in Vigeland Park. These sculptures are part of a group of 36 sculptures made by Gustav Vigeland. They depict the circle of life, from babies to children, adolescents, adults and elders. More of Gustav Vigeland's sculptures. Gustav Vigeland not only designed the Monolith and the circle of life sculptures (see previous photos), but also 58 bronze sculptures depicting the relationships between men, women and children. Another of Gustav Vigeland's bronze sculptures. 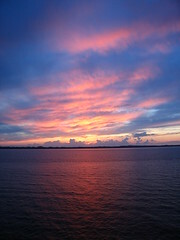 Coming to the end of our vacation, we travelled by ferry from Oslo to Frederikshavn, Denmark, where we arrived at 7.30am. We were back home about twelve hours later.